XOXO Jes - Canadian Entertainment News: Vince Vaughn a Canucks fan? 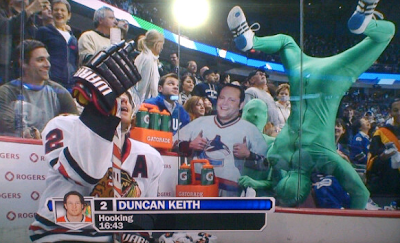 Vince Vaughn a Canucks fan? Anyways, I did quite enjoy this little joke. A cardboard cut out of Vince Vaughn wearing a Canucks jersey. Clever. Vince is probably not in a good mood tonight. So close, so close. So the Canucks live to play another day. Next up, Nashville and the celeb that comes with that game is Carrie Underwood. Should be good times. Funny how hawks fans like to say things like 'Canucks blew a 3 game lead' You never ever mention that you guys blew the FIRST 3 games. Besides, everyone knows Vince Vaughn is a moron. Even his momma. Carrie Underwood on the other hand is smoking hot so I hope they show her after every play.